Since I started this blog, I've been trying to figure out something that I could do that hasn't been done a thousand times before. All the advice I know has been given by far better bloggers than I and far better than I'm capable of. The Moments of the Week slowed to a boring crawl. I don't want to be the jerk who just talks about me. But you know what I've realized? I am really good at making lists. And between writing and years of playing tabletop games like Dungeons & Dragons, I've come to enjoy making characters and helping others make them. So why not continue making lists like the hobbies one to help other people with their character creation? Most likely, this won't be a long-running thing, as there are only so many lists needed for character and world building, but I guarantee, you'll be able to find it here. 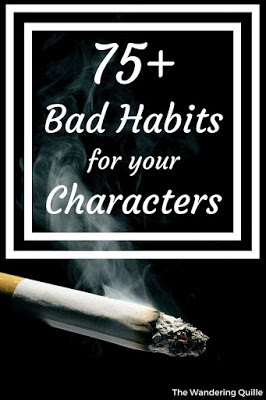 Today, we're looking at bad habits. No character is perfect. Everyone's got these little quirks that they know they should work on fixing. Pick one or two (or more!) for your characters to make them more well-rounded and maybe give them something to improve about themselves.